If your top load washing machine (or some older front load washers) is stuck on one continuous cycle and will not advance and forward to the next wash cycle, then most likely the washer timer is faulty and needs replacement. The timer on your washing machine controls all aspects of the wash, spin, and rinse cycles. When it does not automatically move onto the next cycle, you can assume that the timer is the cause of your problem. You can replace a timer very easily and it should not cost you very much money. No matter what the timer costs, and if you do it yourself, it will save you hundreds of dollars instead of hiring a washing machine repair technician. What causes a washer timer to go bad? It could be that the timer motor has shorted out or the contacts in the timer have shorted. When this happens the timer is not usable and a replacement is needed. What exactly does the washer timer control? NOTE: In a machine with a mechanical timer, the timer only advances when power is being supplied to the timer motor. Make sure to read the wiring diagram. Check: is there power to the timer motor? At that point in the cycle where should the power be coming from? The fill switch? The lid switch? The timer itself? Without knowing why the timer is “stuck” you have not made a diagnoses yet. Diagnoses are made from a series of observations. In an electronic timer machine, various inputs provide information to the computer and the computer decides when to advance the cycle. So be sure that the timer is actually bad before replacing it. It is a matter of removing power from the machine, turning off the water (to be safe), taking off the plastic disc that holds the knob on the timer, remove the knob, remove the screws holding the front panel on, sliding the front panel downward to access the timer, and taking the timer out of the machine by removing a few more screws. The timer will have wires going to it. It should be a wiring harness that can easily be removed from the timer by simply sliding the wiring harness clip off. Find your Replacement Washing Machine Timer online for less. Make things easy and arrange the parts in order as you take them off so reassembly will be super easy. Make sure to keep the screws and other small parts in a bag so every part you need to reassemble is all in one place and you don’t lose anything. This washer timer replacement procedure will work with all top load washers and some front loading washers on the brands Bosch, Frigidaire, GE, Sears, Kenmore, LG, Maytag, Samsung, Whirlpool, Roper, KitchenAid, Inglis, Estate, and Kirkland washers. If you need your washing machine’s service manual to order parts or to see schematics, they can be found here on our Washing Machine Service Manuals page. A new washer timer for your washing machine will cost you from $50 to $120 dollars. You may also need a new washer knob when replacing the timer. 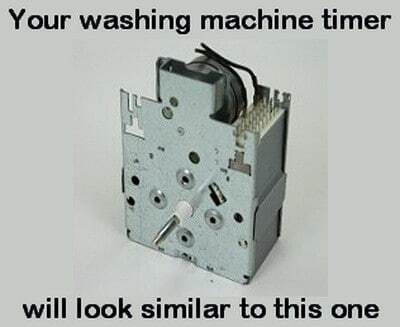 A picture of a washing machine timer is below to help you know what it looks like. 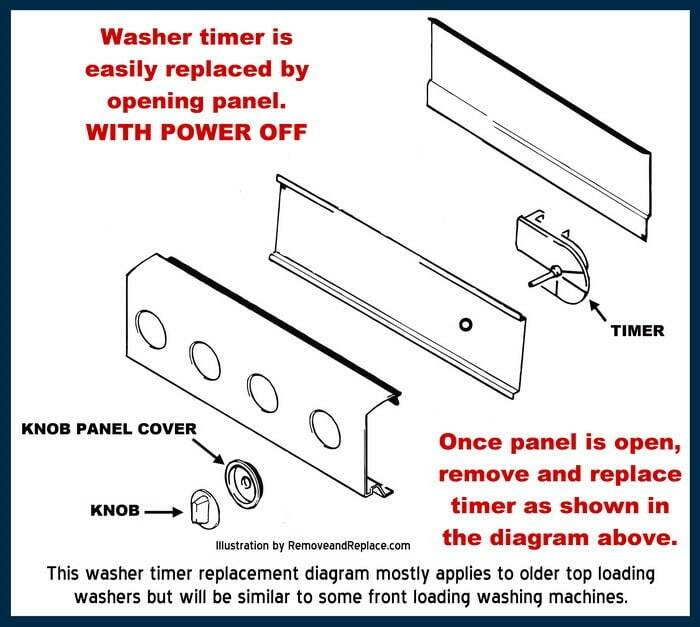 If you have any experience with replacing the timer on a top loading or front loading washing machine, please leave a comment below and tell us any tips or tricks that may help the other readers having the same issue. I have a Whirlpool top load washer Like new but has a terrible smell. My entire laundry room smells and it’s coming from the machine. The fitting on the drain hose (which is rubber smells also)but the hose itself doesn’t. It literally reeks. I’ve tried the cleaning processes but the smell just keeps coming back. Do you have any ideas on what it could be. Its like a heavy musty smell . I overloaded my Maytag top load (no agitator) washer. I didn’t realize anything was wrong, it drained and tried to spin and just kept running all night. Won’t turn off unless I unplug it. When I plug it back in, it starts back up. Sounds like its draining then starting to wash. But nothing actually happens. I’ve tried the suggested resets. Any ideas? The belt is tight there is no motor coupler. Also, the LED light display is out. The start/pause button does not work. Timer? My washer sometimes gets stuck in agitation and wont advance to the next cycle and keeps agitating until I move the cycle to spin. LG Washing Machine WM2655H*A that gets to spin cycle 8 and stays there does not complete spin. Goes into UE after a while and stops. Can get it to spin thru in diagnostic mode. Kenmore elite front load washer. When not loaded works both in normal operation and all test modes. When loaded will start to agitate and work fine until the drum stops to add more water during wash cycle then “tries” to agitate again but drum gets hung up and stays in that mode until I assist the drum to turn-then works until next direction change. It does go into rinse cycle but needs help to tumble…spin cycle is the same scenerio to start then spins great ….The unit will not agitate in test mode either when loaded. machine mechanically taken all apart, drum cleaned, spider assembly ok, bearings checked and drum moves freely. I have a top loading Whirlpool washer. MODEL number LSR5233AW0. It has three wash settings around a knob. Regular with 18-8 minute options, Perm Press with 10-6 minute options, and Delicate with a 6 minute option. The washer will only complete the entire cycle without incident if using the delicate cycle. With the perm press cycle it will fill from any of the time positions and will then stop. I have to manually move it to just past the shortest time for it to begin agitating then I can leave and the cycle will finish. With the regular cycle it will fill then stop. I have to manually advance it to the shortest time period for the agitation cycle then it will stop after a while and not automatically continue to the drain, rinse, and spin cycle. Is it the timer and how hard is it to fix yourself? I’m learning myself how to repair my washer, I can’t afford what the repairmen are asking me to pay, so I go on Google.com and wala, lots of things and how to videos on repairs of anything from washers to microwaves. Sounds like it is your timer switch. It is located behind what they call the console. It’s where your knob are located at the top. That’s usually held in by a few small screws or clips. If you are some what handy with tools, just screwdrivers and pliers, you can change this yourself. My door lid switch went bad, tub would fill, but would not drain. I got the part off Ebay for $9.95 free ship. It plugs in behind that console as well. Just Google how do I replace my timer switch on my whirlpool washer and you’ll have several videos come up for you to watch. That’s how I’ve fixed my agitator dog ears, my lid switch, control knob and timer. Doubt the timer was at fault here. Other possibilities are clutch, couple if direct drive, piece of clothing jamed between the inner tub and outer basket and brake assembly. My Frigidaire GLTF1040AS0 washing machine runs great until just before the final spin cycle. The pump is engaged and is pumping the water out, but it will not advance the cycle past this point and the pump keeps running. Could this be a timer issue or a water inlet valve issue. I had the inlet valve replaced about a year ago, is there away to check if it is working properly? Yes it may be the timer. If there is a bad spot on it, it will not advance. You can try testing the timer assembly with a meter. You can test the water inlet valve with a meter also. Before you replace any parts, always check the suspect parts to be sure the wire harness is secure, not damaged, and connected properly. Sometimes a loose wire harness can be the issue. Have you tried advancing the timer manually to see if it able to advance from the cycle it is stuck in? I have a Samsung front load washer model # wf337aar/xaa . When washing on a normal cycle the indicator progresses through the cycle until it reaches 8 minutes and it hangs there. It will not complete the full speed agitate cycle and shut off. I have tried operating with and without clothes. And I have tried just the rinse spin cycle with the same result. I left the machine run and it will vary in time increasing the number of then reducing it until after 30 to 40 minutes it’s stops without properly spinning the clothes. Any help would be appreciated. If the washer is stopping or adding minutes to the indicator, you may have a bad control board, loose wire harnesses, or hall sensor… Does the washer drain the water? Are you getting any error codes? Hi Bobby, I have the same machine. Mine wont automatically go through the cycles, even though it fills, drains and spins okay. it stops with a nf code but “no fill” is not the problem. Did you ever find out how to fix yours? Other than this, it’s been a great machine for 8 years. My Maytag top load washer #LAT9334AMM will not turn off after the final spin. It will start refilling and want to start another cycle which is next in line on the timer knob. Any ideas? If you have the old style top loader washer with no digital display… Replace the timer control motor and assembly. On your type of washer, this is the only item that can constantly supply power. Also, your model number is incorrect… please recheck your model number and get back to us. My washing machine can finish washing,but the timer will still be reading 45minutes. Can you tell us manufacturer, model number, and serial number of your washing machine? If timer is stuck, it may mean there is a bad spot in the timer and it is not able to advance.